Woodlands Chalet is surrounded by pristine forest. When you step out to any part of the deck, which wraps around two-thirds of the cabin, you are in the forest. You can’t help but take a deep breath and start relaxing. Even though you are on a deck that stands 10-20 feet off the ground, you won’t believe it – the trees are still going up and up. Feel the canopy of the forest, enjoy being there and sensing the natural beauty. Of course, the view is spectacular year round. Located on 2 wooded acres at an altitude of 3400 ft. Click on any photo to enlarge. Also visit the photo album at right for many more photos. 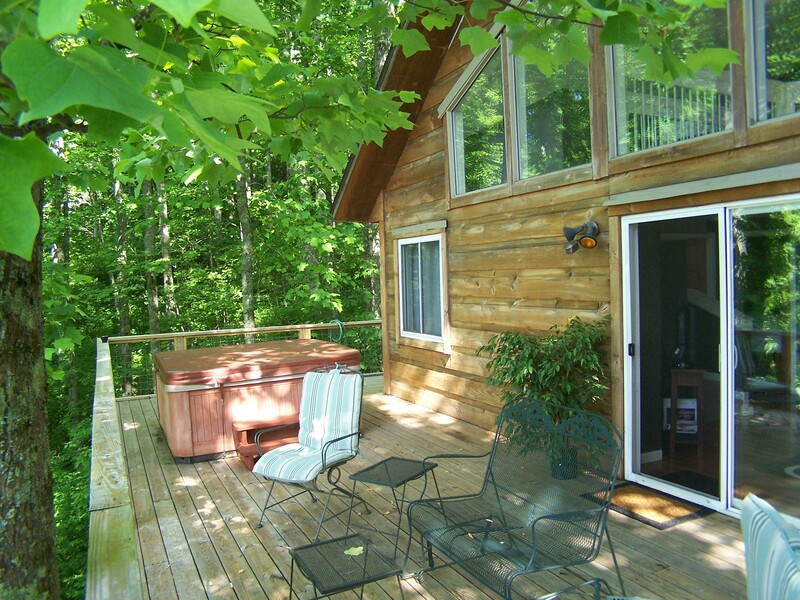 The chalet is a three bedroom cabin with two bathrooms. Two of the bedrooms have king beds and the loft has two wonderful twin beds. The lower level has a day bed with trundle below for extra sleeping. You won’t believe how exquisite the sheets are. You’ve never slept on anything like them. In fact, you may want to buy them (see “amenities for sale” page). Woodlands Chalet has two living rooms; both have a flat panel TV’s with a built-in DVD player each. The master bedroom also has a flat panel TV with a built-in DVD player. The chalet sleeps 6. The lower level living room is where the fireplace is located. You can enjoy reading, watching TV or movie, and relax with a drink. On this level we have a bedroom with king bed. The living area has a day bed with trundle (twin beds). There is also a full bath. This is also where the full size washer and dryer are located. With windows everywhere, the main floor is where the living room, master bedroom, master bath, kitchen and dining room are located. Of course, the kitchen has full amenities for cooking just about any type of meal from plain old home cooking to the finest gourmet meal. When you sit in the dining room, you are flanked by two large picture windows. Here you will enjoy the forest while you dine and be amazed at the beauty as the sun or rain falls through the trees. Enjoy views and forest from just about anywhere in the cabin – from either of the living rooms, the loft, from the master bath, or from the dining room. Of course when you take a dip in the perfectly situated hot tub, rather it be morning, dusk or evening, you will know the beauty of nature. At night, sitting in the hot tub enjoying the stars and the forest are a perfect end to a day of adventure. 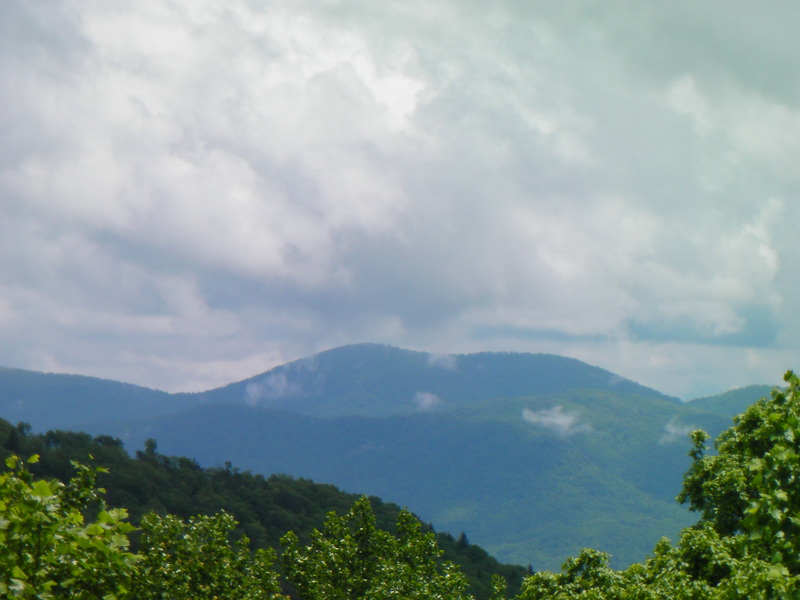 The Woodlands Chalet is located 13 miles from downtown Asheville, about 12 miles from the Biltmore and about 10-12 minutes to the Blue Ridge Parkway. There are a couple of grocery stores nearby and an interesting Amish store you will pass on the way to the chalet.